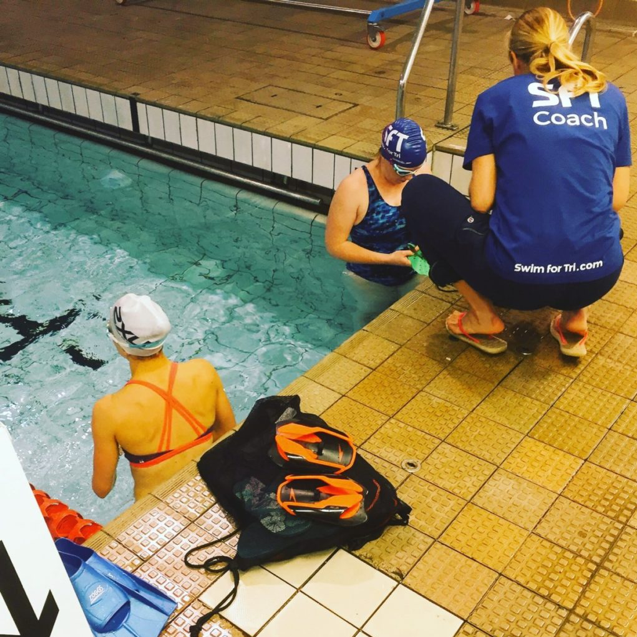 This is a lighthearted look at a coach/swimmer dialogue during one of our fitness sessions. 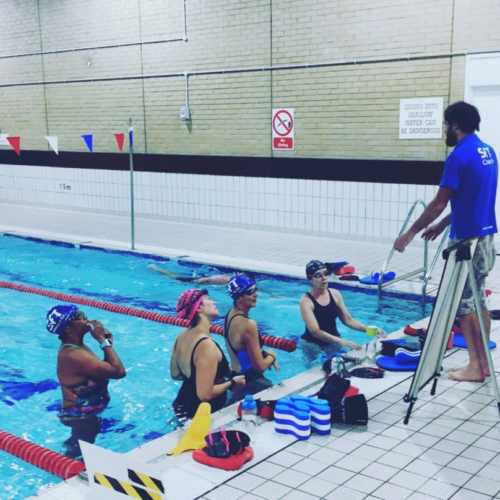 Most days we add a mainset to social media that we may have swum at one of our fitness sessions. 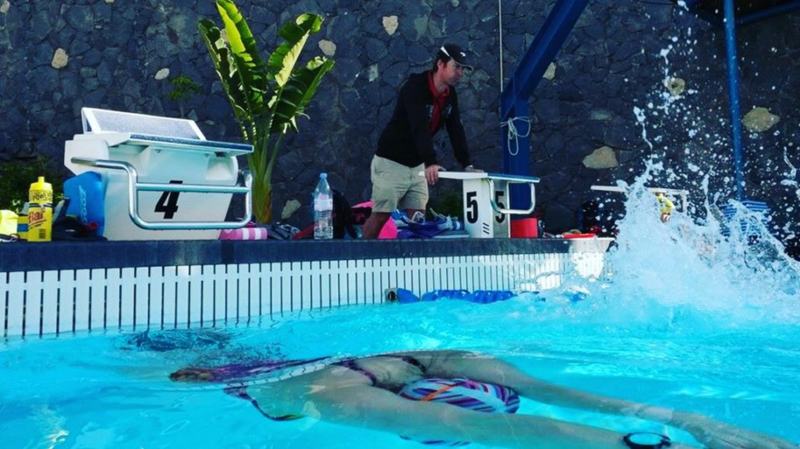 You can find these at #weswam on FB, Instaor twitter. 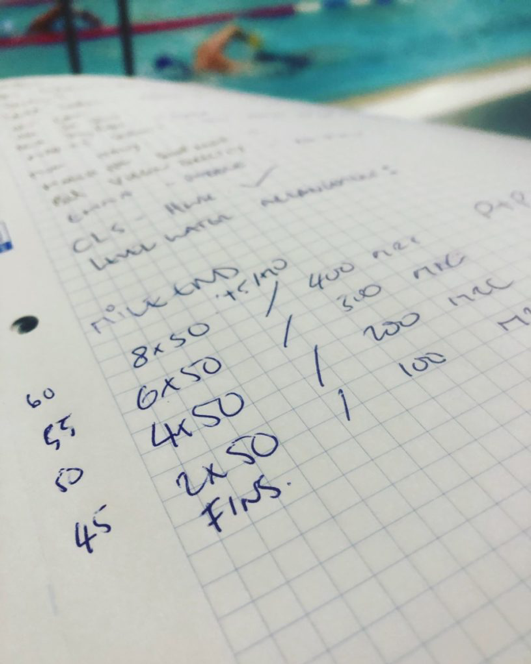 The following should help you read the swim sets. Listen carefully! I will say this only once! 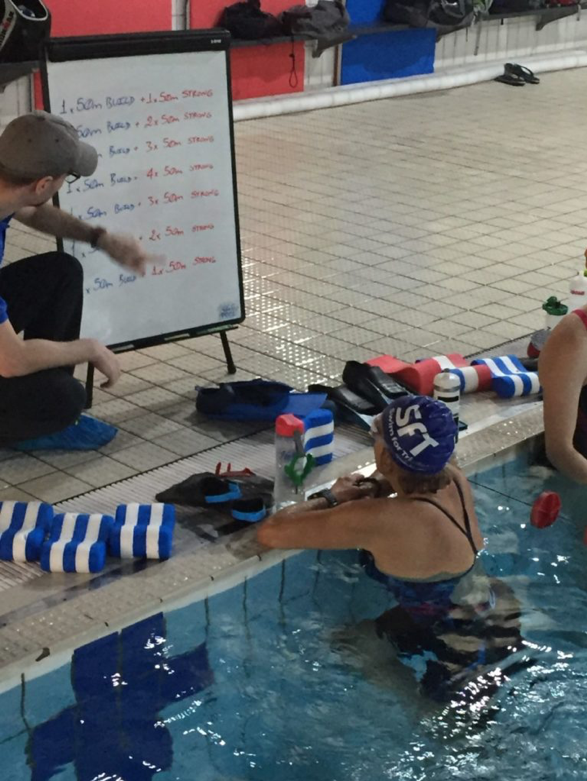 But that’s a 1000m warm-up coach, 40lengths if you still like to swim the old fashioned way. If I make that including that huge 50m of kick what chance of coping with the main set do I have? Where do you want the pull buoy when it comes to the pulling? Normal position or down between the ankles like I remember you mentioned recently? Engage the core more was it? Sounds tough. Can I suggest a 3rdchoice as to where I would like you to stick it. He won’t notice if I sneak those fins on for the kick will he? Ah yes my most favourite aspect of Tri swim training, the opportunity to swim continually at one speed and get yelled at for not changing pace. 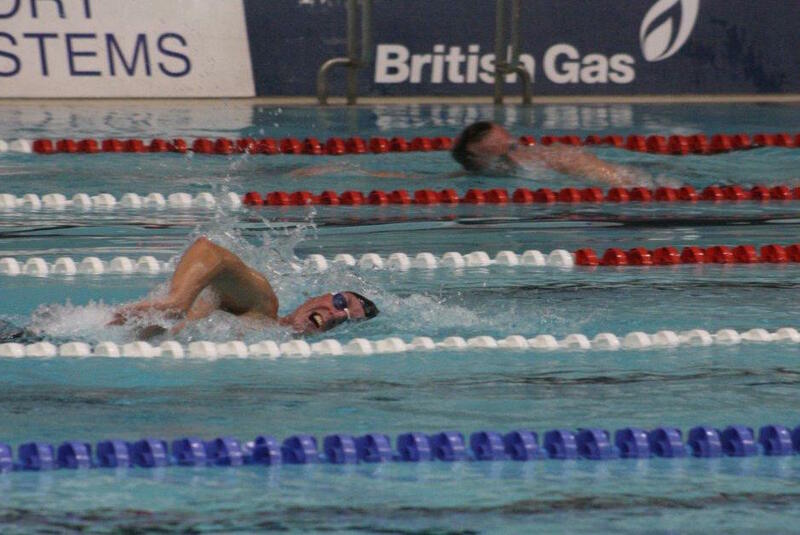 How about if I just kick my legs harder, make some splash yet not necessarily go any faster but just look it. I wonder if that will fool him? If I streamline long enough hopefully I will get halfway down the pool and then won’t have to swim that hard, he won’t have thought of that will he! What does it even matter if I am on the black line or not, there won’t be one on the bottom of the Serpentine. Its like he can read my mind, I guess he will see though the splashy leg idea as well so I perhaps had better try to up the tempo a little. You know just to keep him quiet a bit. Now was it more strokes for more speed? Spin them a little faster? That seems to be helping, its certainly tiring but I am not getting any quicker down this length, those other two guys either side of me are pulling away. 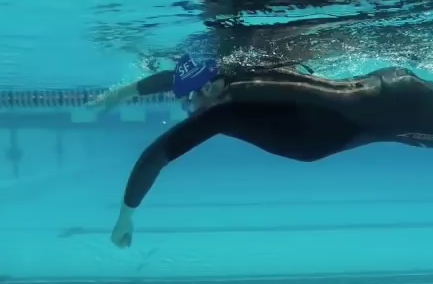 How about accelerating the hand under the water after a good strong anchoring in position, hold the water then pull the body over it. If that works then I guess the over the water bit kind of happens regardless. How do I hold it? Ah yes that’s better, fingertips down, palm facing the wall I’m swimming away from. Now I can feel the back and shoulders getting involved. This sounds like a trick, start out nice and easy, who is he kidding. How will he let me off with that? I wonder just how slow I could go. OK it seems that first 50 was not as slow as I would like. Been holding 55secs throughout so far, and am now at 3:40 for the 200m. Oh I just wish there was more rest. How can I keep on this pace yet make it easier? What was some of that crap he’s been lecturing me about? Ok well I am pushing off each wall gasping so perhaps I could streamline that a little more? Stop breathing upward to the ceiling, as I know that left arm is pushing straight down to the bottom. Come on, get those fingertips down and push backwards. Oh yes that’s it, pivot at the elbow and suddenly that’s easier. Great, hit 4:30 for the 250 that’s a little bit quicker then that 55 pace and my HR dropped a fraction. Sub 70min eh? That wouldn’t be too bad I could live with that, maybe even sneak a 65 with a wetsuit, that would get me out in the top…. whoa what the what’s up with my legs, oh stretch, stretch, stretch please cramp go away not now I am on pace for something special. Please calf, please release and let me go. I promise I won’t run before swim practice next time. Ok that calf is under control and I am back on it, just the 450 and 500 to go, good grief it’s getting harder. How much further? Come on now, keep that breathing under control, I’m trying to breathe to both sides but the air just isn’t coming quickly enough. If I stick to one side though that bloody arm collapses and pushes down. How about if I breathe to one side for one length then swap? Surely that will keep him happy? The arm feels better at least. Oh that’s slower, stop daydreaming and focus, I need to get back on track. If that arm pushes down then that leg kicks out. Keep the kick small, how many times does he have to say that for it to stick? Ok I can get back on track with the second half of this swim; there we go that was a 55, can I hit 8:15 for the 450? So tell me how do I rebuild my stroke? It feels like it has been dragged through a hedge backwards. Ok the fins are helping, the paddle is making it easier to hold onto the water and I can feel the body travelling forwards and over. Thank goodness for that central snorkel, I need that air. So I let these toys do some of the work and artificially prop me up. Ok that makes sense. I guess it make sense to get back to where it was so that I carry it into the next session. I can feel that paddle helping the hand anchor into the water, the fins helping drive the body over the hand. The snorkel allows me to keep the head still, that’s useful I can actually watch the hands, feel the rotation all without that constant interruption. 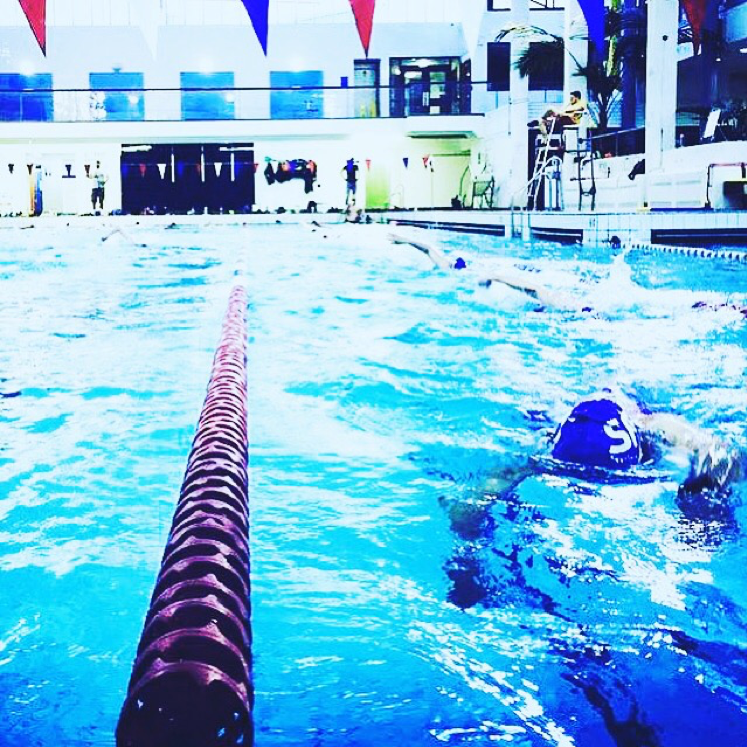 At the age of 10 I was taken to my first early morning swim training session (a whole 3 minutes away!) by my parents. I was woken with a cup of tea and I remember moaning about how early it was. Dad was great, and reminded me this is what champions needed to do. He was going to drop me off on the way to work and then Mum would pick me up afterwards with a mad dash to get ready for school. It was no real hardship and having learned to swim many years earlier it was a natural progression. Fast forward many years and many medals later – coaching did not immediately appeal. As I retired and thought about what was next, after a wonderful 4 years of swimming in a US college, a scholarship to a private sports school and the opportunity to race around the world, poolside with kids at swim club did not appeal. 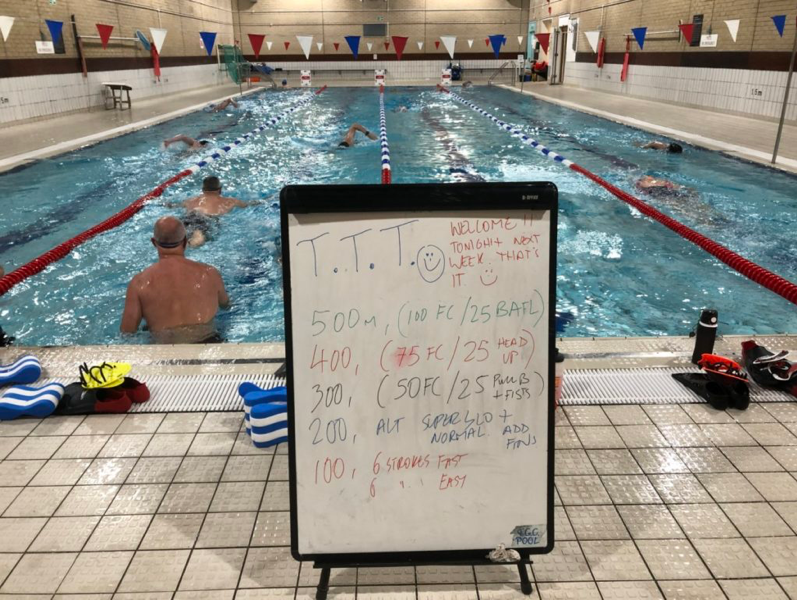 Via the sport of Triathlon and the opportunity to help adults learn to swim faster a new challenge was presenting itself. Kids were a different entity and did not appeal, as was adults learn to swim. Adults learning to swim faster was not really an easy option and not many had explored this area. Keeley and I started SFT for exactly this. 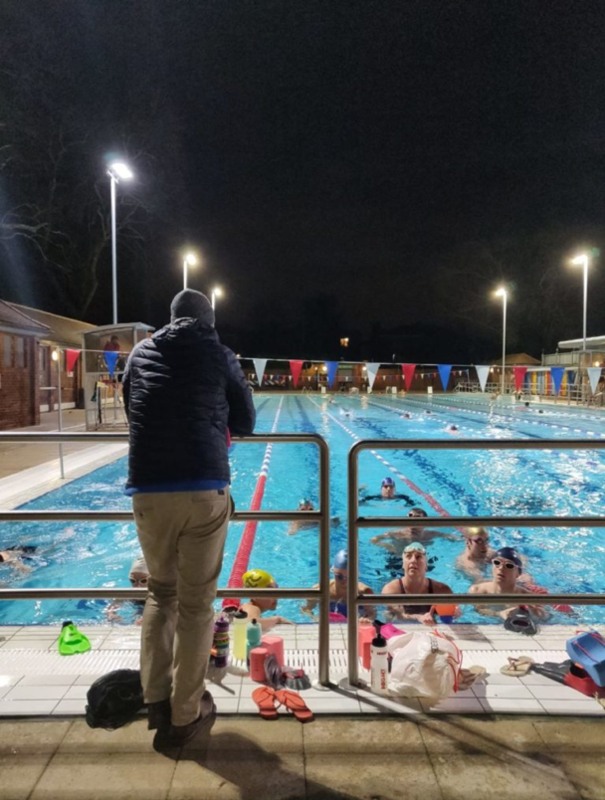 February 2018 and a young adult by the name of Eid approached me to help him learn to swim faster. Without knowing his full story I was intrigued that already he was pretty quick having only learned to swim a few months earlier. 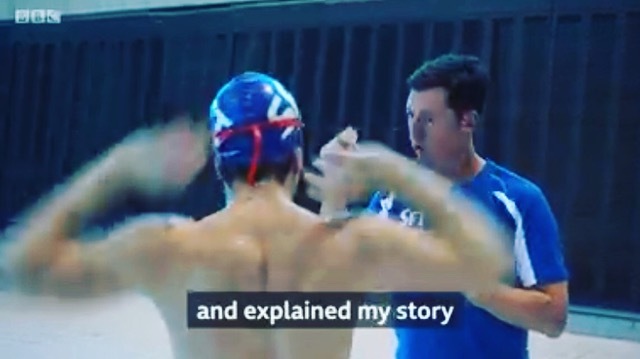 In fact so intrigued I double checked with some local swim teachers to see if I was being told the full story. A rate of progress from 0 – 3km in 4 months seemed fanciful. Apparently it was true – and then Eid’s full story unfolded. 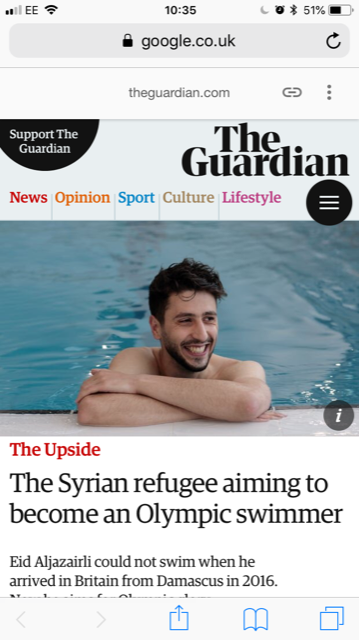 Not only had he only just learned to swim, he had to overcome the harrowing journey of fleeing his home country on a flimsy boat knowing that he could not swim if something went wrong. Most mornings Eid gets to swim practice on a bus in the depths of winter. My swim upbringing could not have been more different, and my journey made easy by supportive parents. 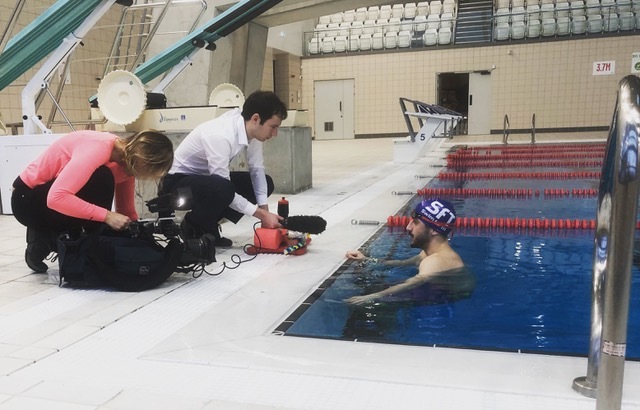 We have been happy to support Eid as best we can writing letters to the Team GB and the IOC, asking for sponsors, swimming and racing with other groups to give him the best chance. Last year the IOC announced there would be an IOC refugee status team in Tokyo. Sub 30secs is our objective and with a solid winter of training I see that happening Spring 2019. Sub 28secs is possible in 12months if Eids current rate of progress is maintained. Just to confirm 12 months ago he could barely manage a length of FC. It is a remarkable rate of progress. Currently, Eid is swimming approximately 34secs for 50m.